Archive for tag "Tarja Teppo"
Ecosummit TV: Ecosummit TV moderator Anna Yukiko Bickenbach (Ecotastic) interviews happy participants at Ecosummit Berlin 2013. This Ecosummit TV video features Lillian van Someren Greve (Ecosummit Ambassador), Andreas Spiess (Solarkiosk), Josefine Ahl (Oricane), Fujio Kojima (Pirika), Alexander Lidgren (Swedish Energy Agency), Tarja Teppo (Cleantech Invest) and Jan Michael Hess (Ecosummit). Since our first event in 2010 until our fifth conference this year in Berlin we have managed to build a strong community of cleantech startups, investors and corporates that enjoy honest conversations and productive networking at our events. It feels like a family. We are proud to host the next smart green family reunion in London on 15-16 October 2013 at the Crystal. Come and join us. Ecosummit TV: Tarja Teppo (Cleantech Invest) moderates the smart green lean startup panel at ECO13 Berlin featuring Jari Varjotie (Savosolar), Bart Markus (Wellington Partners), Peter van Gelderen (Icos Capital) and Jan Marckhoff (Ben Energy). Given that most cleantech startups are capital- and time-intensive, we believe that the lean startup philosophy is the right medicine. Lean startup is all about resource efficient product development with fast iterations to achieve product market fit without wasting too much time and money. While lean startup works well for software startups, the question is whether it can also be applied to hardware startups. For the strategy discussion between the startup management and their VCs, lean startup also means to take smart make or buy decisions to maintain focus and, for example, outsource manufacturing or distribution to reduce CAPEX and OPEX. During an inspiring discussion, our panelists share their experience with being lean while being clean. Ecosummit TV: Jari Varjotie pitches Savosolar from Finland at ECO13 Berlin. The cleantech startup develops and manufactures very efficient solar thermal absorbers and collectors that are based on patented optical nano coating. In fact, Savosolar claims to be the most efficient solar collector in the field and over 30 customers are a pretty good market proof. Savosolar is backed by Cleantech Invest and currently raises a new round of €4M of which €2M will be public funding. Break-even is planned for 2014 and we believe Savosolar to be an attractive investment opportunity with a nice risk return profile given the advanced development stage of the Finnish startup. Go for it, the sun rises in the north. Ecosummit TV: Josefine Ahl pitches Oricane from Sweden at ECO13 Berlin. The smart green startup provides green software for big data applications that saves a lot of hardware and energy. Their product BioCAM is an energy efficient NoSQL database with very low CPU and memory footprint. Oricane is backed by Finnish VC Cleantech Invest. Josefine is so confident of the benefits of Oricane’s software that she proposes a new software licensing model which is not based on CPUs but rather on the service level itself. 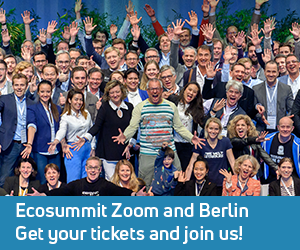 At ECO13 Berlin, Oricane won Ecosummit Award 2013 Facebook Bronze and, the next day, Josefine demonstrated that she rules the art of startup pitching, too. 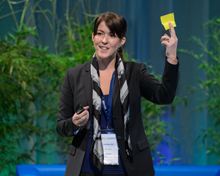 Ecosummit TV: Tarja Teppo pitches the Helsinki-based early stage VC Cleantech Invest. Their portfolio currently consists of 11 smart green startups including Savosolar, Enercomp, One1 and Swap.com. As home markets are rather small, Scandinavian cleantech startups go international very quickly and are very interested in foreign investors, partners and customers. Cleantech Invest is part of the Vigo Accelerator of the Finnish government which provides €1M grant money to early stage startups to leverage the VC investment. Tarja’s ambitious goal is to create a large evergreen cleantech fund by doing an IPO. We are proud to have Tarja as Ecosummit Advisor and look forward to promoting the best startups from the Nordics.